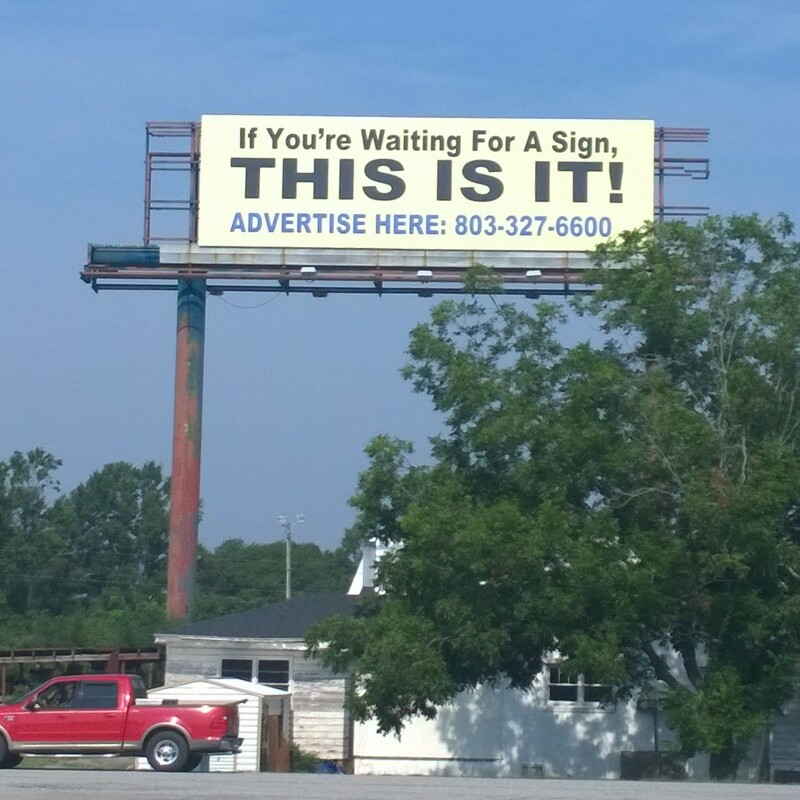 If You’re Waiting for a Sign, This is It! We’re all looking for signs, signs for wealth, good health, romance, adventures – omens, things that auger that good fortune is on it’s way. But we all interpret signs differently. In Ireland, a black cat crossing the road is a harbinger of good luck, whereas in the USA it’s the opposite. I had plenty of time to think about signs yesterday when I was barreling down Highway 501 in South Carolina. 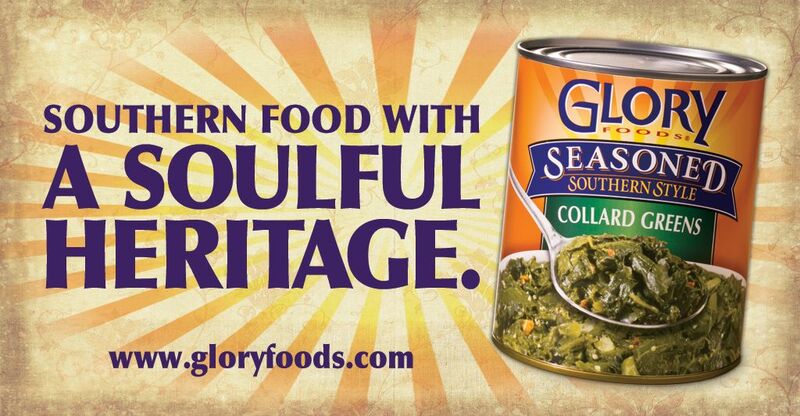 The first were the Glory Foods billboards. These were clever. They were everywhere. Sometimes there were three of them within 100 yards (91 meters for my metric friends.). Throw your Taste Buds a Party! and my favorite: Give Peas a Chance. Then there were the signs for a place called: South of the Border. Well, what can I say? Bizarre, just bizarre. I remember driving down Highway 301 when I was a kid and seeing signs like these every 10 miles (16 km) or so. Pedro says… and Back Up Amigo You Missed Us. Imagine how our world would be if we actually considered these questions before we said or did anything? If our politicians did? Okay, I know that’s impossible to imagine, but what about us? Seriously! Think about it! It made me think about my good friend Karl G Waechtler, a Rotarian and fellow pipe smoker whom I admire. I’m going to write them down. Why don’t you? Come on – Give Peas a Chance! Love and kindness too, while you’re at it. I am writing this in a cafe, down a flower and fern filled alley in Blowing Rock, North Carolina. Need to hit the road soon but for now I feel like lingering over coffee, and the overhearing of soft, but succinct, North Carolina accents.The accents always make me think of “Andy of Mayberry”, and my Aunt Pearl who was from Raleigh. There’s a horse show in town and so the population is filled with graceful young women wearing riding trousers, with fresh natural complexions and perfect postures. I wander around slightly bent from riding, wearing my bulky riding trousers and my Belfast Northern Ireland Harley Tee shirt. I don’t receive much prolonged eye contact. I’ve been trying to open myself to omens and Divine Providence on this trip, accepting somehow that things will work out, will happen for a reason. I want to see what it’s like to not have expectations, not get frustrated. Hard to get frustrated when things don’t go your way when you don’t care which way they go. I stop at Hardees in Adairsville and get a breakfast biscuit. They give me the wrong one. I start to take it back then I remember I’m trusting how things go, so I sit back and just enjoy eating it. Back on the bike later and somehow I miss the turnoff to the Blue Ridge Parkway. Turn around? Nah, I’ll just keep going. I know I’ll cross it again up ahead. Finally, I see another sign and take it and see directions to the Bat Cave. Holy surprise Batman! But I don’t go that way. I head the direction of the parkway. In a short time I’m on the parkway and it’s magnificent. 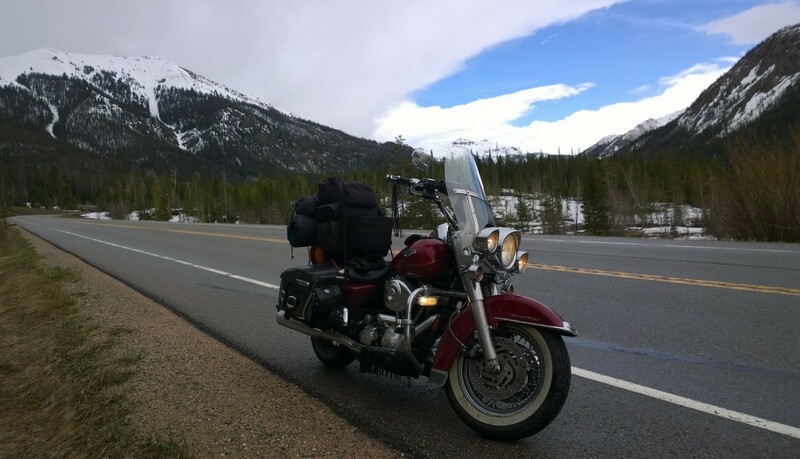 I don’t know if you’ve been on it before but imagine a road that travels along mountain ridges, craggy rock ledges, gaps, valleys, forests and meadows with no traffic lights, gas stations, restaurants, or stop signs for 469 miles, from northern Virginia to Cherokee, North Carolina. (You can exit the parkway for gas and lodging and something to eat.) It is amazing. And accompanying you are incredible mixes in colors from the Rhododendrons, Black Eyed Susans, Oxeye Daisies, Wild Hydrangea, Queen’s Anne’s Lace (Lowly named Cow Parsely In Ireland!) and other purple and scarlet wild flowers. The highest point we rode through was the Richland Balsam Overlook, weighing in at a mere 6,047 feet! Can you just imagine the views from there of the rolling mountains with clouds drifting through them? Or can you remember a time when you were surrounded by the alluring scent of fir, spruce and pine? Well, that was me. Thankful and grateful, even when the rain came a calling. The only drawback to the parkway is that the speed limit is only 45 mph, which on some of the curvy stretches was just fine. Around 5 pm (I had started at 7:45 am) I was tired and needed a place to hunker down and walk around some. I took the next exit which turned out to be Blowing Rock. It’s a beautiful place with a great old country town main street full of shops, restaurants, pubs and a park. I stopped and walked around. I could smell the incredible scent of someone making candy. I could hear the clanging of horseshoes in the park and saw folks sitting on benches eating ice cream. This felt like the right place to stop. Now, where to stay? I walked around some more, glanced down a side road and saw a place called the Hemlock Motel. Hemlock, of course, is what my hero Socrates drank for his punishment for being found guilty of corrupting the youth, encouraging them to think for themselves. Hemlock is also one of my favorite literary poisons! Literary, not literally! They had a room at a fair price, so Big Red and I set up camp there for the night. Great place. Later, I went for a walk around the town and found the Six Pence Pub, coincidentally a sister pub to the one I used to frequent in Savannah, Georgia. A cold pint of Harp beer did the trick rightly. Then I walked back to the Hemlock Motel, making absolutely sure I corrupted no youth on the way home!